This weekend I was on call for work, so while I was waiting I finished up a few more blocks for the Batik quilt. I have 21 more blocks to finish then it will be time to start arranging them. Right now I’m just tossing them up on the wall as I finish them. I’m also up-to-date on my Star-A-Day blocks. I need to get busy and trace the templates. I only have stars traced to get me through Thursday and 3 of them are not cut out. The section I’m working on now will have 32 stars in it. Finally, I’ve rounded the 3rd corner on my DWR. The chart is updated on my sidebar. 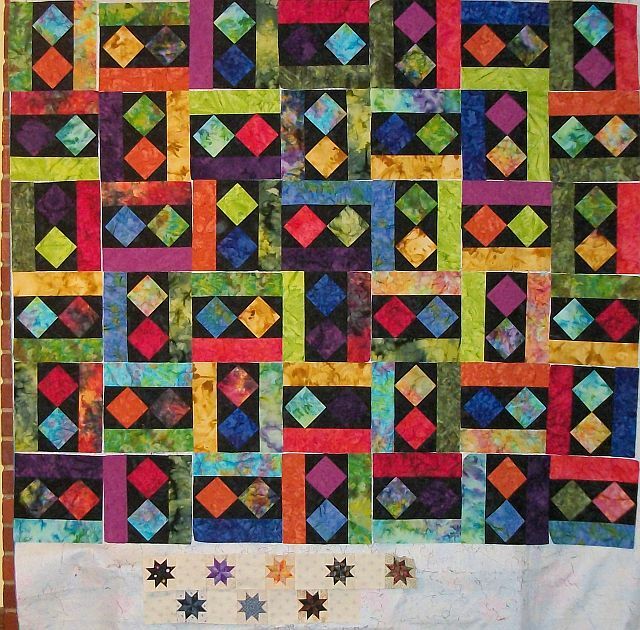 Check out what others are working on by visiting Patchwork Times. Beautiful fabrics and great design to make them shine! this will be a lovely quilt. What a fun quilt! Your batiks are beautiful. Love it! I like how you threw them up on the design wall…looks great! Love your Batik quilt. Beautiful pattern. What beautiful fabrics. Batiks always make such striking quilts.